Wolfgang Amadeus MOZART: Prelude and Fugue in D minor, K. 405, No. 4 (after J.S. BACH, BWV 877) (1782-83); Larghetto cantabile in D major and Fugue, K. 405, No. 5 (after J.S. BACH, BWV 874) (1782-83); Adagio and Fugue in A minor (after J.S. BACH, BWV 867); Allegro in C minor, K. Anh 44 (1785?) & Fuga à due Cembali, K. 426 (1783); Adagio cantabile and Fugue in E-flat major, K. 405, No. 2 (after J.S. 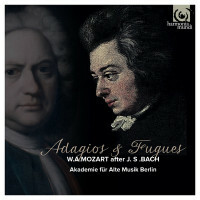 BACH, BWV 876) (1782-83); Adagio and Fugue in C minor, K. 546 (1783-88); Adagio and Fugue in E major, K. 405, No. 3 (after J.S. BACH, BWV 878) (1782-83); Adagio and Fugue in B minor (after J.S. BACH, BWV 891); Adagio and Fugue in D minor (after J.S. BACH, BWV 849). Akademie für Alte Musik Berlin. Harmonia Mundi HMC 902159 (1 CD) (http://www.harmoniamundi.com/). In reviving Bach’s St. Matthew Passion in 1829, Mendelssohn started something big. However, the Leipzig Cantor was not totally unknown in the preceding years. Bach’s fugues were in circulation, and Mozart made their acquaintance by at least 1782, producing a variety of string ensemble arrangements, often prefixed with his own introductions. Apparently Bach’s own keyboard preludes were not yet in common enough circulation for Mozart to have known them. Thus it surprises when a somber Adagio performed by winds turns the corner onto a familiar keyboard fugue, such as the angular A minor, BWV 867, from WTC I. Apparently Mozart’s arrangements take slight liberties: His sources strayed from Bach’s original, not because Mozart thought to make improvements. Mozart understandably made awkward keys more comfortable: The last track, in D minor, presents the C# minor fugue from WTC I. The preceding B minor fugue is the B-flat minor fugue from WTC I, BWV 891, not BWV 849 as the disc indicates. The Akademie executes with gravity. We’re in the presence of serious stuff, Bach and Mozart at their contrapuntal best. These are not the spurious fugues with new Adagio preludes arranged for string trio (K. 404a). The Akademie takes apt liberties with instrumentation. The multi-part strings in the closing D minor Adagio and Fugue yield to winds for a bold, regal statement. Strings reappear later in a glorious cumulative effect. Mozart’s own contrapuntal effort is the C minor fugue for two pianos, K. 426, here preceded by an incomplete Allegro scrap, K. Anh 44, which breaks directly into the stern fugue. While Mozart apparently rarely transcribed and rearranged his own works, he did provide a string-ensemble version of the C minor fugue with a different and completed Adagio introduction (K. 546). The aggressive theme with its falling fifth and subsequent diminished seventh recalls Bach’s patterns; Mozart’s dense counterpoint, including the sunny appearance of the theme’s inversion, shows close study of the German master. Pyotr Ilyich TCHAIKOVSKY: Excerpts from Swan Lake, Op. 20 (1875-76; arr. Sergei ZAGNY as Fragments from Swan Lake by Piotr Tchaikovski, 2003). NYYD Ensemble, Toomas Vavilov (cond.). FancyMusic FANCY014 (1 CD) (http://www.fancymusic.ru/). The arranger allows that some liberties may have been taken to bring out counterpoints and transitions. 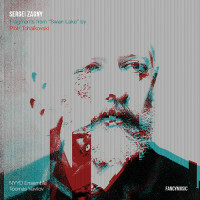 Even though Zagny suggests that a few of the 12 movements are pure Tchaikovsky, his remark that additions have been made suggests a higher degree of tampering than may actually have occurred. Some listeners may never suspect that several numbers end strangely (abrupt stops, unexpected cadences, phrases which momentarily get stuck, added dissonance); however, there is one wholesale intrusion when a cadence morphs into Bruckner. It is possible not to notice these moments although the notes give fair warning. Is Swan Lake damaged? If anything, I have listened closer to this mini-suite than I would to real Tchaikovsky. The NYYD Ensemble, an Estonian group, plays cleanly. The oddities held my interest as I tried to process whether this or that detail might have been in Tchaikovsky’s original. Piotr Ilyich TCHAIKOVSKY: Nutcracker Suite, Op. 71a (1892). Duke ELLINGTON and Billy STRAYHORN: Nutcracker Suite (1960). Harmonie Ensemble/New York, Steven Richman (cond.). Harmonia Mundi HMU 907493 (1 CD) (http://www.harmoniamundi.com/). 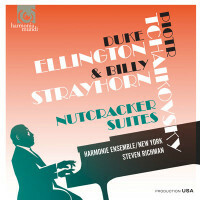 Perhaps this is the first time Tchaikovsky’s original and the Ellington/Strayhorn arrangement meet up on disc. I would have expected the Boston Pops to have made the connection, and wouldn’t be surprised had both suites actually been programmed together, just not recorded. Because of its overfamiliarity, Tchaikovsky’s Nutcracker resists a fair hearing. In certain seasons it becomes inescapable, and yet we must admit that less good music wouldn’t hold up nearly as well. Richman does a fair job, though I have heard faster tempos and greater precision from true ballet orchestras. The bigger risk is the Ellington/Strayhorn arrangement which immediately begs comparison with the Duke’s own 1960 recording (Columbia CK 46825 among other reissues). Ellington’s band’s magical quality is due in part to cheery reverb and separation effects. A close listen provides a mini-seminar: how Ellington and Strayhorn vary the original lines, breaking them across instruments, reusing melodies as accompaniment, revising rhythms, creating fresh gestures from Tchaikovsky’s shapes, offering dissonant chords, etc. Wolfgang Amadeus MOZART: Excerpts from Die Zauberflöte (1791; arr. anon. for two flutes or violins, 1792; arr. Les Quatre Violons, 1998). Jean-Philippe RAMEAU: Suite of Airs and Dances (arr. Joseph-Barnabé Saint-Sévin dit L’abbé le fils for two violins, 1761; arr. Les Quatre Violons, 1998). Jean-Baptiste FORQUERAY: Chaconne, La Morangis ou La Plissay (1747). Les Quatre Violons: Hiro Kurosaki, Simon Heyerick, Mihoko Kimura, Isabel Serrano (vlns). Warner Classics 2564 68399-8 (1 CD) (http://www.warnerclassicsandjazz.com/). Apart from concertos by Telemann and Vivaldi, there is not much music for an ensemble of four violins. A quartet constituted thus is poised to suffer from balance, as there can never be a strong and low enough bass line. The ensemble Les Quatre Violons seems to have solved this problem by starting from 18th-century arrangements for two violins, always a well-balanced and popular duo combination. Also they play on period instruments in an airy, translucent style. Their name recalls Les Vingt-quatre Violons du Roi formed at Louis XIII’s request. Each of these four players has been associated with Les Arts Florissants. The Mozart excerpts begin directly with Papageno’s Der Vogelfänger bin ich ja. There is no overture, just ten tuneful numbers. The most effective are Papageno and Papagena’s tunes which include the requisite bird imitations. The Queen of the Night’s aria offers a study in instrumentation as the Queen’s part, even at the coloratura moments, is given to a middle voice. These arrangements work well because the players know the opera’s nuances. 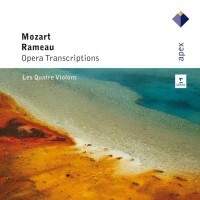 The Rameau collection has six movements: Ouverture and Pantomime (from Pygmalion), Menuet (Platée), Air des Sauvages (Les Indes galantes), Ariette de l’Amour (Pygmalion), and Gigue (Zaïs). As with the Mozart, these players know the style and French manner. Perhaps more heft for the fast half of the Pygmalion Ouverture or more savagery for the Air might have helped these good efforts. Possibly intended as an encore, the Rameau suite concludes with the Chaconne from Forqueray’s Third Suite, which enchants in this formation. This recording, even Les Quatre Violons themselves, seem to have come and gone.